Manono was born on Maui in the 1780s; her father was Kekuamanoha, and her mother was Kalola-a-Kumukoʻa, a wife of Kamehameha. Through her father, she was a granddaughter of Kekaulike, the Mōʻi (King) of Maui. At the time of Cook’s arrival (1778-1779) (while the Colonists were battling the British on the continent,) the Hawaiian Islands were divided into four kingdoms: (1) the island of Hawaiʻi under the rule of Kalaniʻōpuʻu, who also had possession of the Hāna district of east Maui; (2) Maui (except the Hāna district,) Molokaʻi, Lānaʻi and Kahoʻolawe, ruled by Kahekili; (3) Oʻahu, under the rule of Kahahana; and at (4) Kauaʻi and Niʻihau, Kamakahelei was ruler. Separate Kingdoms ruled separate parts of the Islands. However, conquest was in the air and battles and negotiations for power and control were going on. When Keōua, the father of Kamehameha, died, he commended his son to the care of Kalaniʻōpuʻu, who received him, and treated him as his own child. (Dibble) Following Kalaniʻōpuʻu’s death in 1782, the kingship was inherited by his son Kīwalaʻō; Kamehameha (Kīwalaʻō’s cousin) was given guardianship of the Hawaiian god of war, Kūkaʻilimoku. Dissatisfied with subsequent redistricting of the lands by district chiefs, civil war ensued between Kīwalaʻō’s forces and the various chiefs under the leadership of his cousin Kamehameha. The people were divided about keeping the traditional social structure or abandoning it. Kekuaokalani, Liholiho’s cousin, opposed the abolition of the kapu system and assumed the responsibility of leading those who opposed its abolition. These included priests, members of his court and the traditional territorial chiefs of the middle rank. Kekuaokalani demanded that Liholiho withdraw his edict on abolition of the kapu system. (If the kapu fell, the war god would lose its potency.) (Daws) Kamehameha II refused. The two powerful cousins engaged at the final Hawaiian battle of Kuamoʻo – a battle for tradition versus the modern. In December 1819, just seven months after the death of Kamehameha I, opposing heirs met in battle on the lava fields south of Keauhou Bay. 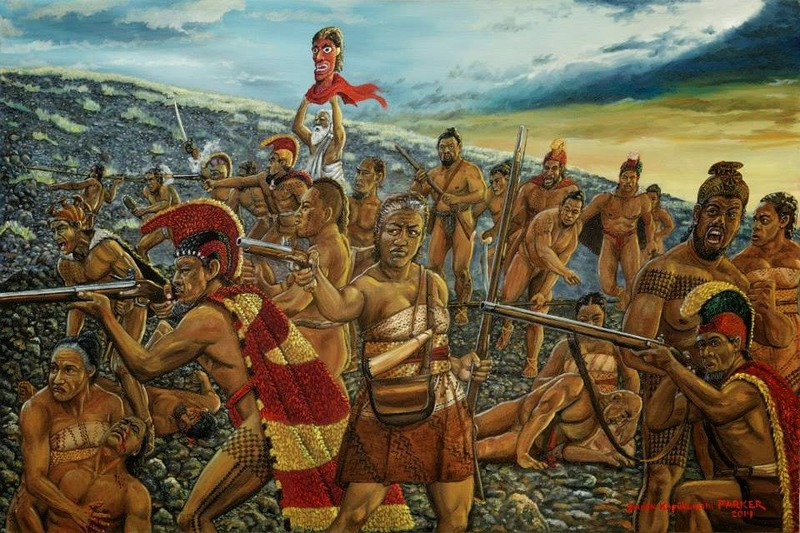 Liholiho had more men, more weapons and more wealth to ensure his victory. He sent his prime minister, Kalanimōku, to defeat his cousin. The image ‘Kekuaokalani and Manono Battle at Kuamoʻo Dec. 1819’ by Brook Kapukuniahi Parker was the inspiration for this summary. Front and center is Manono, standing beside her husband Kekuaokalani. In the back, a kahuna holds Kūkaʻilimoku, the Hawaiian war god, first entrusted to Kamehameha I, who passed it on to Kekuaokalani. Kalaniʻōpuʻu was born about 1729, the son of Kalaninuiamamao and his wife Kamakaimoku. He died at Waioahukini, Kaʻū, in April 1782. His brother was Keōua; his son was Kiwalaʻō; he was the grandfather of Keōpūolani. While Kalaniʻōpuʻu was at Hāna he sent his warriors to plunder the Kaupō people. Kahekili was king of Maui at that time, when Kahekili’s warriors met those of Kalaniʻōpuʻu at Kaupō, a battle developed between the two sides. 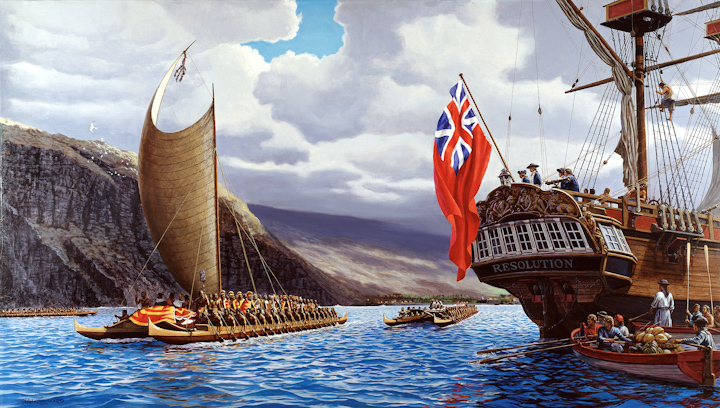 It was known as the Battle of Kalaeokaʻīlio; Kalaniʻōpuʻu’s army was routed and returned to Hāna. Unfortunately, Kalaniʻōpuʻu was not aware of the alliance between Kahekili and the O‘ahu warriors under Kahahana, the young O‘ahu chief, and these numerous warriors were stationed at the sand dunes of Waikapū and also at a place close to those sand dunes seaward of Wailuku. However, knowing that Kahekili would not look upon her with favor, Kalola suggested their son, Kiwalaʻo be sent instead. Kahekili welcomed Kiwala‘ō; for a time, after the great Sand Hills battle in Wailuku, peace and tranquility returned. At the time of Captain Cook’s arrival (1778-1779), Kalaniʻōpuʻu was on the island of Maui. Kalaniʻōpuʻu returned to Hawaiʻi and met with Cook on January 26, 1779, exchanging gifts, including an ʻahuʻula (feathered cloak) and mahiole (ceremonial feather helmet.) Cook also received pieces of kapa, feathers, hogs and vegetables. 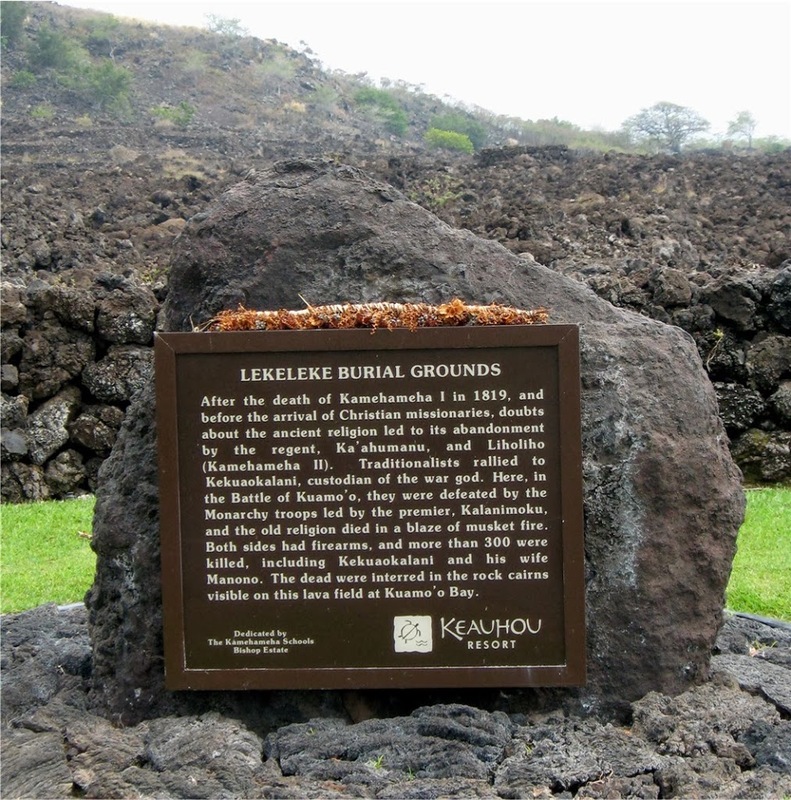 In the first major skirmish, in the battle of Mokuʻōhai (a fight between Kamehameha and Kiwalaʻo in July, 1782 at Keʻei, south of Kealakekua Bay on the Island of Hawaiʻi,) Kiwalaʻo was killed. In the Islands, over the centuries, the islands weren’t unified under single rule. Leadership sometimes covered portions of an island, sometimes covered a whole island or groups of islands. Island rulers, Aliʻi or Mōʻī, typically ascended to power through familial succession and warfare. In those wars, Hawaiians were killing Hawaiians; sometimes the rivalries pitted members of the same family against each other. Following Kalaniʻōpuʻu’s death in 1782, the kingship was inherited by his son Kīwalaʻō; Kamehameha (Kīwalaʻō’s cousin) was given guardianship of the Hawaiian god of war, Kūkaʻilimoku. 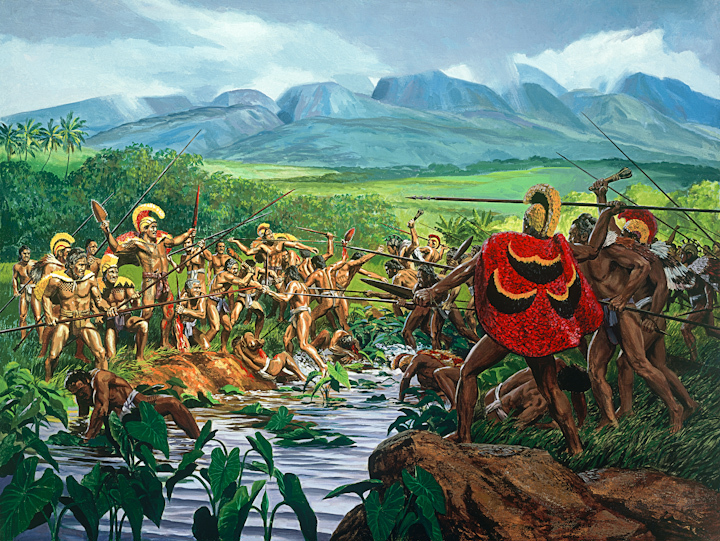 The image shows a depiction of the Battle of Nuʻuanu (HerbKane.) In addition, I have added other images in a folder of like name in the Photos section on my Facebook and Google+ pages.